WW1 Reenactments Equipment : Great War Tommy WW1 Food Rations Labels : Jack Tar British Salmon can label. WW1 Reproductions and WW1 Reenactors Equipment / Kit - Jack Tar British Salmon can label. 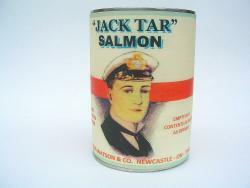 "Jack Tar" British Salmon can label. Label for "Jack Tar" finest imported salmon put up by Angus Watson & Co, of Newcastle-on-Tyne, a major WW1 supplier of canned goods to the War Office. Features an image of a young midshipman and the Union Flag.